Thanks to eBay I was able to pick up a few of the 14 card 2008 Topps team sets. 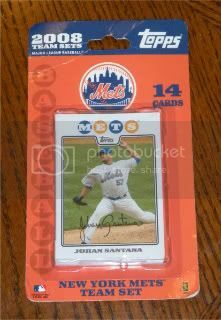 The lot I won included a New York Mets set. 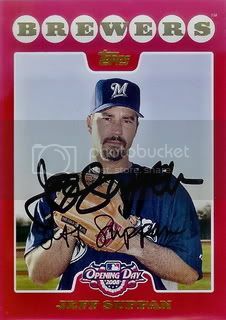 Not only did Jeff Suppan sign his regular 2008 Topps card for us back in July, he also signed his card from the Opening Day set. 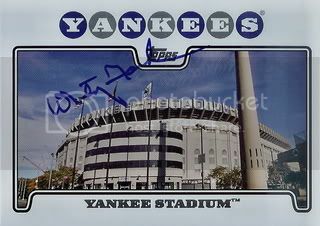 Last December I picked up the New York Yankees 55 card Gift Set which included a card of Yankee Stadium. I wasn't sure who to send this one to at first but soon decided on Yankee legend and Hall of Famer, Whitey Ford. This stadium card will go great with the stadium cards we already have signed by Duke Snider and Bobby Doerr. Whitey was one of the best pitchers of his era and I definitely appreciate him signing this card for our collection. 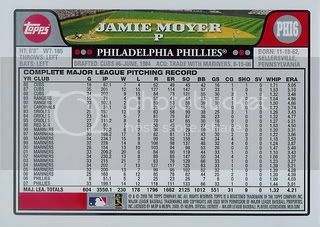 Back on June 2, 2009, Jamie Moyer signed his regular 08 Topps cards for our set. You may remember this post. 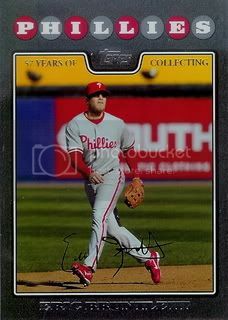 We recently sent Jamie another TTM request and this time he graciously signed his card from the Phillies 14 card team set. 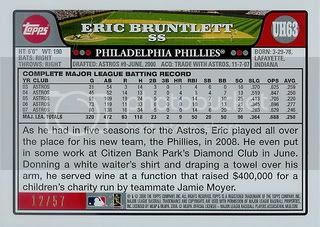 Yes, it looks identical to his regular card but it's numbered differently on the back. These team set cards don't count for our set but I'm always happy to add anything 08 Topps related to our collection. In my quest to collect anything 08 Topps-related I finally broke down and bought on of the All-Star jersey cards from the Updates & Highlights set. 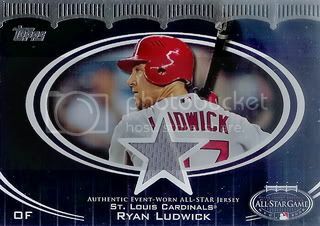 Got a good deal on a nice Ryan Ludwick card. Yep this only cost us one dollar. 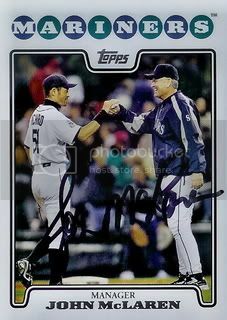 Former Seattle Mariners manager, John McLaren signed a card for our set. John is currently the bench coach for the Washington Nationals. While doing a little research on his Wikipedia page, I realized John is now the bench coach under manager Jim Riggleman and Riggleman was McLaren's bench coach in Seattle. 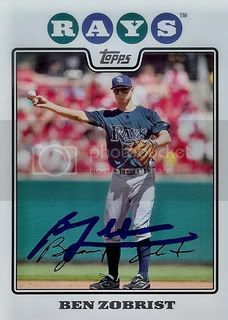 Former first round draft pick and current Baltimore Orioles ace, Jeremy Guthrie signed a card for our set. He even personalized it to my son. Awesome! Got this one back from a recent TTM request. 2009 American League All-Star, Ben Zobrist signed a card for our set. He also included an extra Bible card which he also signed. Thanks, Ben! When I decided to start collecting the 08 Topps set I didn't even know that black bordered parallel cards existed. They're numbered to 57 and usually go for more than I'm interested in paying on eBay. Picked up our first one for one dollar. I was happy. 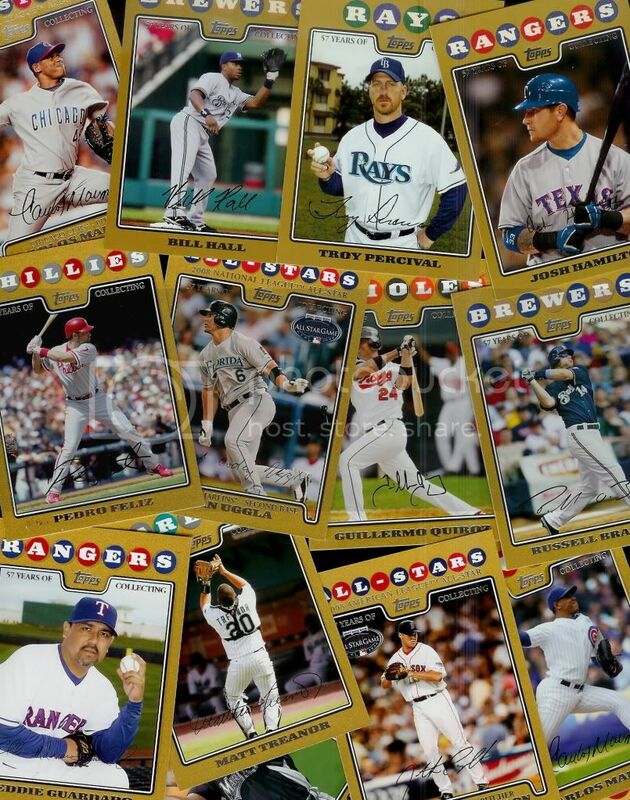 Have you ever wanted to quickly find all of the 2008 Topps cards we have signed by Chicago Cubs players? 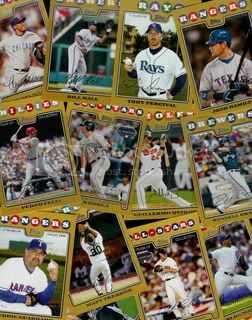 Or have you ever been curious how many signed 2008 Topps Opening Day cards we have? Well now you can! You probably didn't notice but we just made a few minor changes to the blog this week. The most important is the addition of labels to most of the posts. A list of the labels can be found at the bottom of the right hand column. Included are each of the 30 MLB teams as well as seperate posts for the Chrome set, Team Sets, etc. I intentionally chose to only list the team on the posts for the base cards since that's our bread and butter. Also, we have renamed the posts to correspond with the card that is featured in the post. The generic "Mail:" titles have almost completely disappeared, however they may return when we start running out of 2008 Topps cards to post about. Don't worry that's still far off but I'm always thinking of ways to keep this blog going when that happens. If you have any suggestions or comments on either of these changes or for anything else, let me know. 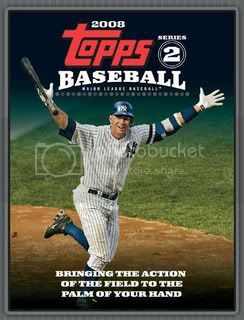 Thanks for reading My 2008 Topps Set Blog! Raiderdan from SweetSpotGraphs.com hooked us up with six more signed 08 Topps cards. 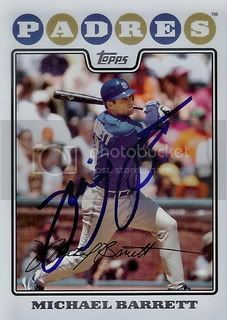 The final card sent was of former San Diego Padres catcher, Michael Barrett. After spending time with the Blue Jays last season, Michael joined the New York Mets organization. He spent the last month or so with the Buffalo Bisons, Raiderdan's home team. 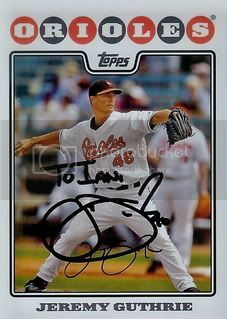 The next card he sent is of former Baltimore Orioles outfielder Jay Gibbons. Jay was practically out of baseball after the 2007 season but has made it back to the big leagues by playing for the Los Angeles Dodgers this year. I've been wanting to pick up some of the gold border parallel cards from the 2008 Topps set for awhile. I have a few from opening packs but I thought it would be cool to get a few more. Thanks to eBay I am now the owner of 16 more gold border cards. Hopefully I'll be able to get a few of these autographed. 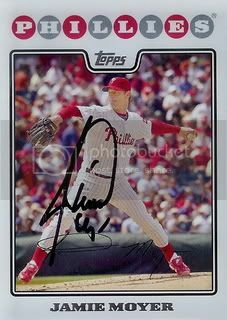 The fourth is of former Phillies pitcher, Tim Lahey. Tim is currently on the Minnesota Twins AAA team the New Britain Rock Cats. 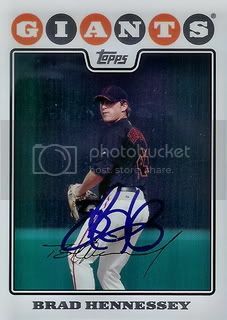 The third signed card is of former San Francisco Giants pitcher, Brad Hennessey. Brad is currently with the Minnesota Twins organization but hasn't pitched in the Majors since he was with the Giants in 2008. 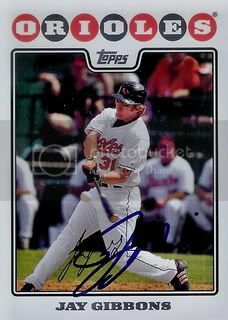 The next is also of Nate McLouth. Nate has struggled a bit this year with the Atlanta Braves and even found himself back in AAA for awhile. He's back in Atlanta and it looks like he's starting to put up the big numbers we're used to seeing. 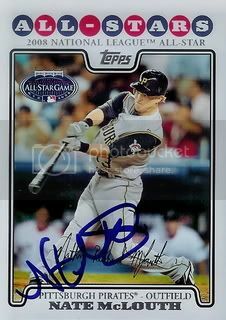 The first one he sent is of former Pittsburgh Pirates All-Star Nate McLouth. This card also marks a milestone. We are officially one-third of the way done with our goal of getting the entire 2008 Topps set signed. A special thanks to everyone who has helped out or followed along. Thanks to eBay I was able to pick up a few of the 14 card 2008 Topps team sets. 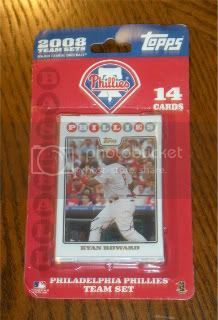 The lot I won included four Philadelphia Phillies sets.